This is still in the planning stages. I'm looking to score some colored guitars on the cheap right now so I can put them to the test. We already have several other tests underway, so give us some time and stay tuned! Rather than build, it is much cheaper to just buy inexpensive guitars to test the UV on. This saves me a lot of time and money, as time is pretty scarce around here. Keep in mind that many of these will use different types of finish, although all will surely be some kind of poly. 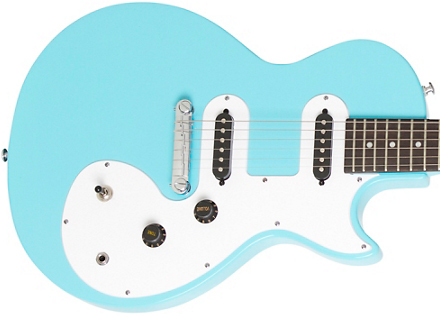 To get things started, I ordered an Epiphone Les Paul SL in pacific blue. These currently sell for $99 with free shipping and are a fun looking little guitar anyway. They remind me of the old Gibson Melody Maker, and are nothing at all like a real Les Paul, but they add the name for marketing purposes, I get that. Here is the stock image of the guitar, I will update with real photos once it gets here, likely in a week or 10 days.